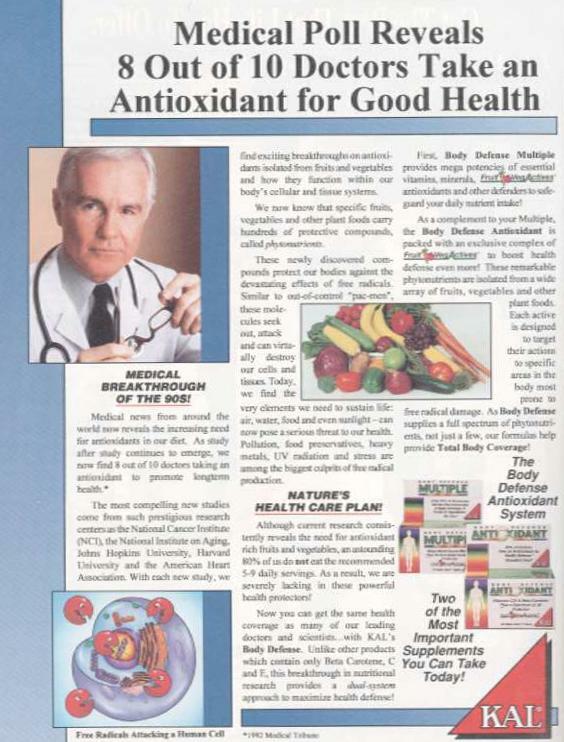 This ad appeared in many health-food industry publications during 1994. Small print at the bottom cited a report in Medical Tribune (a newspaper for doctors) as the source of the "8 out of 10" statistic. This figure was also reported on Good Morning America by a commentator who should have known better. No survey on antioxidant usage had actually been done; the editor had merely asked for opinions on the use of vitamin E. About 80% who responded wrote favorable comments, many of which described their recommendations to patients. No attempt was made to determine whether the respondents were typical of Medical Tribune readers or physicians in general, or whether they personally took supplements. The percentage of people who do or don't do something cannot be measured this way. Although I discussed the situation with the editor, Medical Tribune did not report what had happened to its readers.